Top Iranian commander dismisses West's demand to have Iran's military sites inspected as part of nuclear deal. 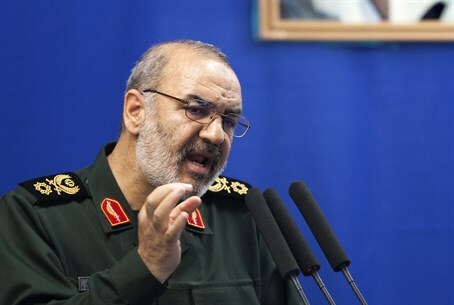 A top Iranian commander on Sunday said that his country will never permit “foreigners” to inspect its military sites. “Not only will we not grant foreigners the permission to inspect our military sites, we will not even give them permission to think about such a subject,” Brigadier General Hossein Salami, the second-in-command of the Islamic Revolution Guards Corps (IRGC), was quoted by Press TV as saying. “They will not even be permitted to inspect the most normal military site in their dreams,” he declared. Salami added that a harsh response awaits anyone who talks about such inspections. “Visiting a military base by a foreign inspector would mean the occupation of our land because all our defense secrets are there. Even talking about the subject means national humiliation,” he said, according to Press TV. The comments come amid reports that a final deal between Iran and the P5+1 powers could see Tehran allow international inspectors to visit its military sites. Iran has categorically denied the reports, describing them as mere rumors and as wrong interpretations of the understanding reached in early April in Switzerland. The Islamic Republic has clashed with the West, and particularly the United States, over the interpretation of the framework deal, and took particular exception to an American fact sheet released after the framework deal was reached. Iran has been insisting that all sanctions be lifted immediately for any agreement with the West to go into effect. The State Department was quick to dismiss this demand. As well, top Iranian officials have declared they will start using advanced IR-8 centrifuges that are 20-times as effective as standard ones as soon as a deal is reached, meaning they would be able to produce a nuclear arsenal in a rapid timeframe.